The international oil industry has entered an era in which maintaining oil production levels increasingly involves unprecedented risk, escalating costs and tighter margins. The past decade has seen a reassertion of state control over national petroleum resources, which has continued to limit international oil company (IOC) access to easy oil. The bulk of the oil that remains freely accessible to IOCs is technically difficult and expensive to produce such as the Canadian tar sands, ultra-deepwater and the offshore Arctic. BP’s Gulf of Mexico disaster highlights the scale of the risks involved in pursuing some of these marginal resources. We label these resources marginal oil as their high cost and high risk places them at the top end of the production cost curve and as such they are vulnerable to emerging trends towards efficiency and climate change regulation that may dampen demand growth and stabilise price. We detail specific risks for each of these resource categories. To maintain Reserves Replacement Ratio (RRR) rates above 100%, IOCs have increasingly turned to tar sands and ultra-deepwater in the face of the continuing decline in their conventional oil fields. The new exploration frontier, the offshore Arctic, is typical of the high risk, high cost resources that companies are striving to acquire in order to boost reserves in the future. Our research found that at least four of the top six IOCs have significantly relied on tar sands reserves additions to support RRR rates in the past five years. As a percentage of total liquids additions, tar sands represents between 26% and 71% of reserves additions for these four companies. However, this is a best estimate that probably understates the case for most of the companies as the publicly available data for reserves additions is highly opaque. There is no disclosure of the role of deepwater resources in reserves additions; most of the data is simply divided regionally. A look at company disclosures of total resources suggests that the trend towards marginal oil is only likely to intensify. Adding to the changing risk landscape, created by the rising dominance of marginal oil resources in IOC reserves, is the emergence of new business models that do not boost reserves figures but nevertheless generate profits. The service agreement contracts signed by some IOCs in Iraq are prime examples. The analyst community may need to modify existing valuation methods or develop new ones to assess and value companies in light of the changing landscape. Reserves replacement in particular no longer appears straightforward in its reflection of company performance and value. 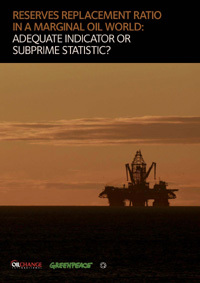 It may also be the case that the existing valuation model, with its emphasis on the replacement of hydrocarbon reserves, is encouraging risk taking because it fails to assess the relative risks of accessing different hydrocarbons or, for that matter, alternative modes of profit generation. Traditional valuation models that primarily value hydrocarbon production growth and reserves replacement appear increasingly inadequate in a carbon constrained economy. This briefing details the increasing challenges being faced by IOCs as they struggle to maintain business as usual. It highlights the changing landscape and raises difficult questions about the role investors and analysts might play in helping or hindering the transition to more flexible business models for oil companies.